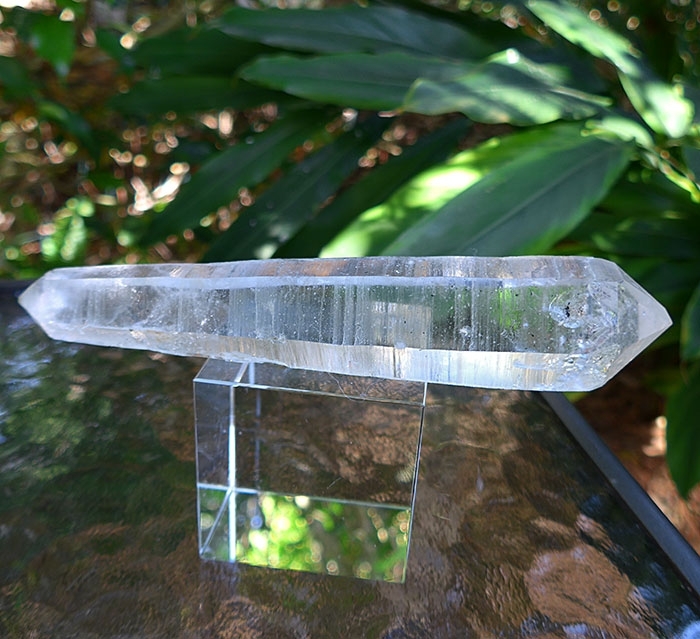 Dimensions (HxWxD): 7" x 1.5" x 0.8"
This extraordinary 7 inch long Capelinha Magic DT Enhydrous "Bubble Quartz" Wand, weighing 218 grams or nearly 1/2 pound, exhibits a large channel in the female termination tip, inhabited by a gigantic bubble in a large channel! 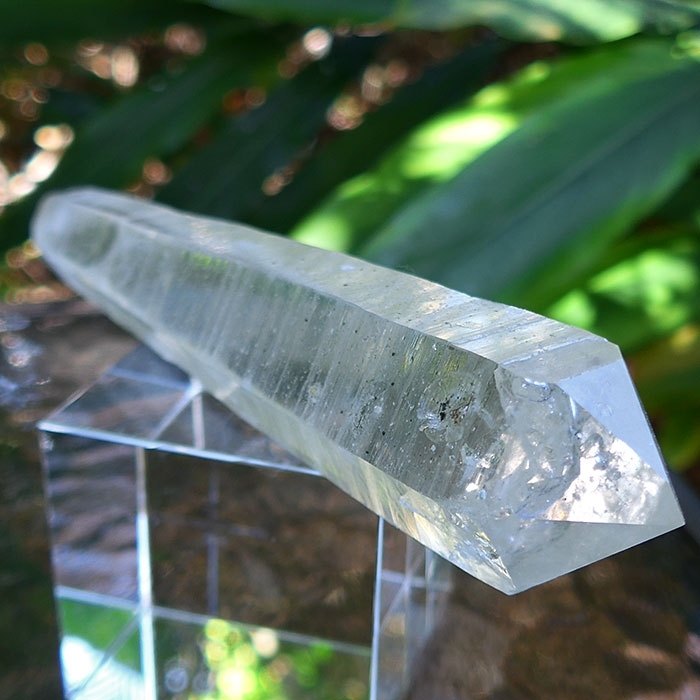 This unique wand is terminated on both ends, and the male termination tip appears to have largely broken off during this unique crystal's growth, and you can see see bits of the matrix in which the crystal grew, along with darker minerals, quite possibly epidote, which is often found in crystals in this region of Brazil. This unusual find comes from Capelinha in Minas Gerais, Brazil, and resided in Jane and Curtis' personal collection on our meditation altar for over ten years. Jane says she used this wand for Reiki and for meditation, and it was extremely powerful, despite the truncated male termination tip. Meditating with this beauty brings apeaceful mind and a tranquil heart and soothes the astral body. This is one of the most cool water bubbling wands we've ever had in our hands! You can see a good shot of a large water bubble below! 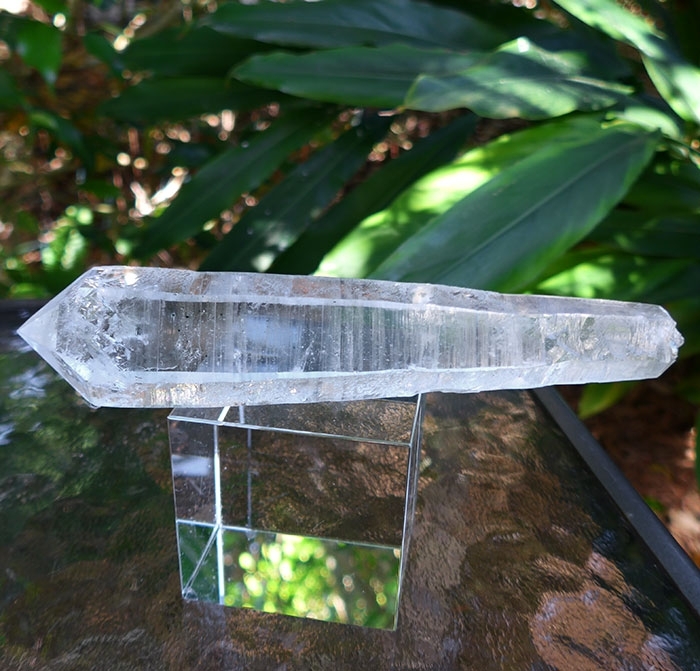 This rare crystal wand is not too big to hold in the hand during meditation or energy treatments, and is large enough to make a striking centerpiece on your altar, night stand, computer workstation, desk, or coffee table. 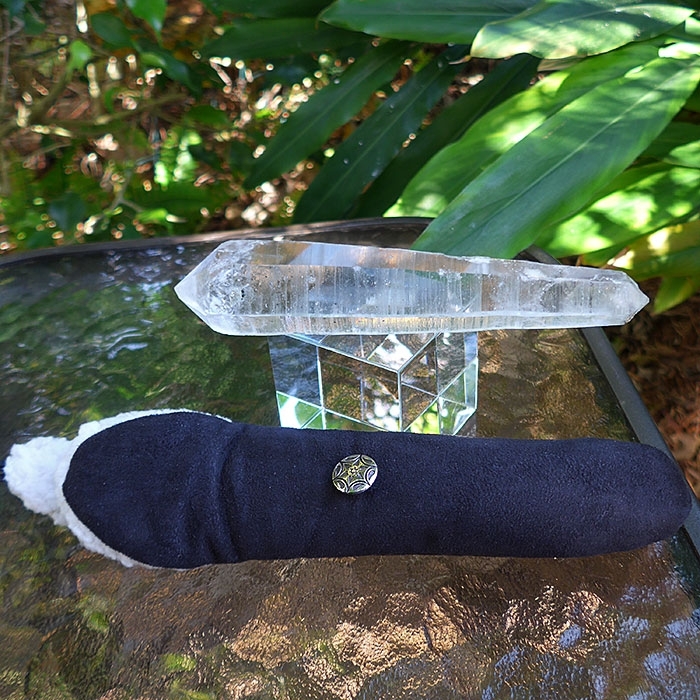 This amazing specimen comes complete with its own FREE microfiber and fleece pouch for safe keeping and safe travels! The word enhydrous comes from the Greek and means "having water within". The American Geological Institute’s Glossary of Geological Terms uses the term "enhydro" strictly to refer to "a hollow nodule or geode of chalcedony containing water, sometimes in large amounts". 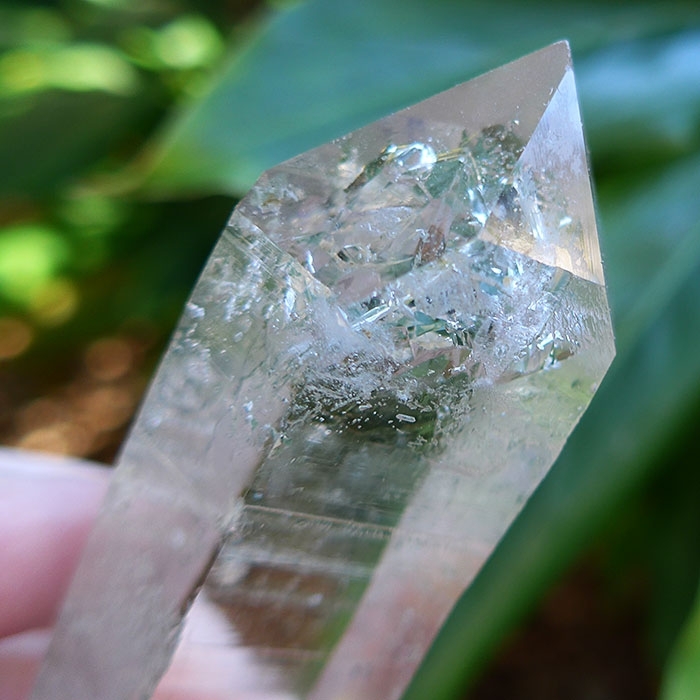 Most rockhounds refer to any crystal containing a pocket of water as an "enhydro" and we prefer the common usage to technical terminology so we refer to water-containing crystals as enhydros. Enydros often contain bubbles of air trapped in the pockets of water within the crystal, and so they are also sometimes called "water bubble quartz". 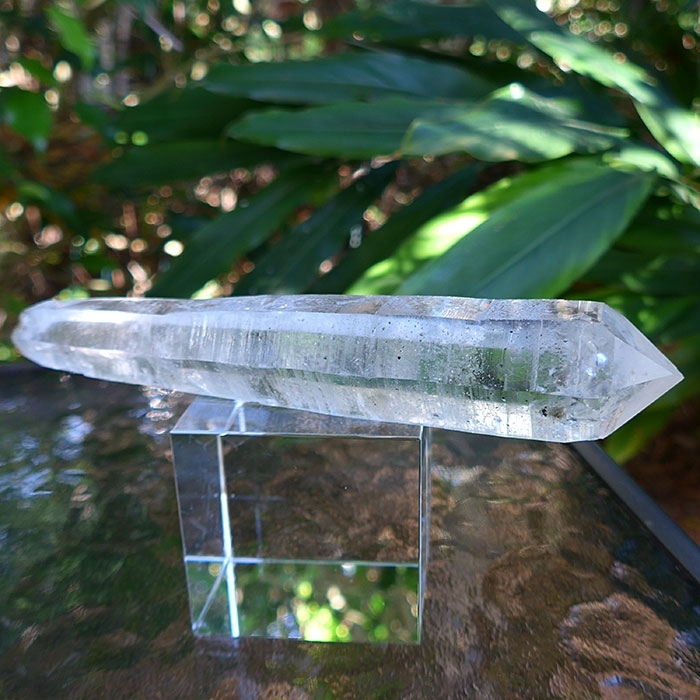 Water bubble quartz enhydros like this large Brazilian crystal wand were formed by some estimates as much as 220-400 million years ago. The edges of the quartz formation crystallized faster than the inner regions, forming troughs that trapped water and other material. As the inner troughs cooled, and were covered by yet more layers of crystal growth, the trapped liquid would cool and contract, forming air bubbles within the crystal. 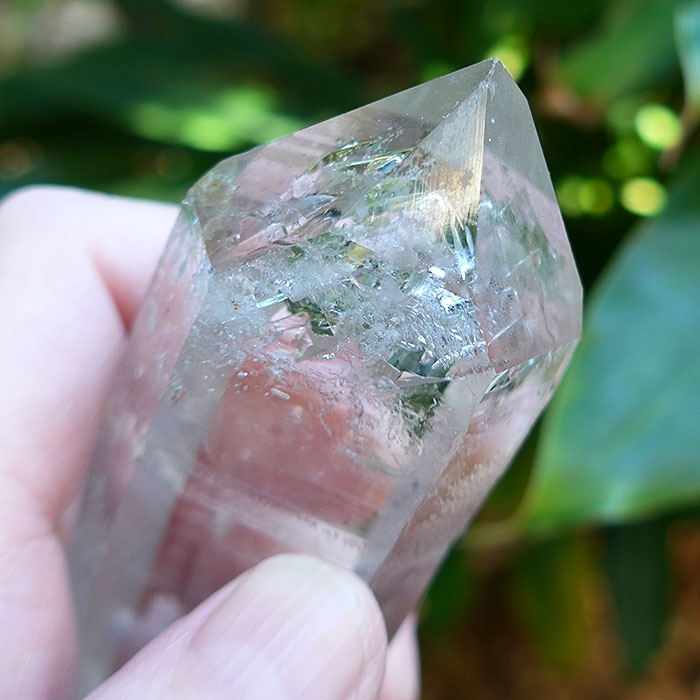 By the logic of their formation, enhydrous water bubble quartz usually contains more inclusions than other types of crystals, so you won't find stunning clarity in a water bubble quartz crystal. That would be against their nature. Thus enhydrous crystals can be used to purify the emotions, to encourage the smooth flow of emotional life, to remove emotional blockages, and to facilitate the release of emotional blockages caused by traumas in this and previous lifetimes. 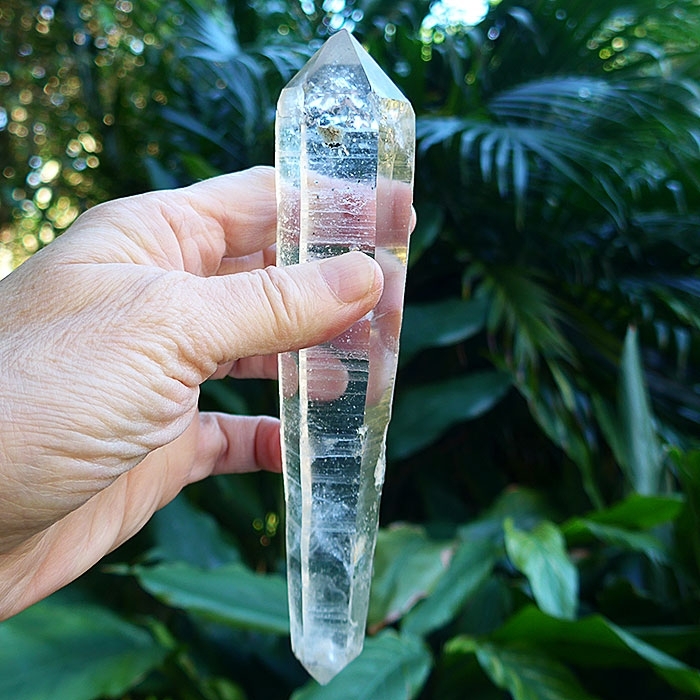 We know you will accept this crystal treasure into your life with gratitude to Mother Earth, and use it to heal yourself and to heal others. Note: Actual weight is 7.7 oz. or 218 grams.